Tattooing is a $1.65 Billion dollar a year industry in the United States and 45 million (or 14%) of all Americans have at least one tattoo (StatisticBrain, 2012). That percentage increases to 36% for the 18-25 year-old age group and 40% for the 26-40 year-old age group (StatisticBrain, 2012). With so many Americans today getting tattoos and with public awareness of tattoos increasing due to popular TV shows such as Miami Ink, questions about the social acceptance of tattoos seem particularly relevant. As a heavily tattooed mom, and former Administrative Assistant at Yankee Tattoo in Burlington, I set out to discover what the current attitudes are toward tattoos in Vermont, as well as elsewhere around the nation. My first tattoo was etched at Yankee Tattoo in 1998 for my 18th birthday. Just two days after getting my new marker of adulthood, I moved to Spain for a semester abroad. As I was a “prefect” (R.A.) in one of the dormitories at my boarding high school, I sent a postcard to my “prefectees,” telling them about my experiences in Spain and adding a postscript mentioning my new tattoo. When I returned to school the next term, my prefectees sadly asked why I had not sent them a postcard as the other absent prefects had. Confused and upset, I replied that I had indeed sent a postcard! When I asked my dorm advisor if she had received my post card, she admitted she had, but didn’t read it to the dorm because she felt my mention of a tattoo to be “grossly inappropriate” and felt it “did not set a good example” for my charges. I reminded her that I was 18 years old and that my tattoo was neither offensive nor easily visible. My advisor sat me down and gave me a long and unwanted lecture on communicable diseases and negative workplace attitudes toward tattoos. The experience infuriated me. This was just the first in a long line of negative comments I was to receive about my tattoos over the years. I now see that this experience only served to make me more interested in tattoos and more committed to correcting negative stereotypes surrounding tattoos and tattooing. Where Do Tattoo Stereotypes Come From? There are many possible explanations for the tattoo stereotypes and attitudes that influence our perception of tattoos in American culture. One might be that numeric tattoos were widely used by the Nazis during WWII to designate prisoners interred at concentration camps. Also, tattoos have often been associated with sailors, circus people, criminals, and violent gang members. As Urie Bronfenbrenner’s Ecological Systems Theory explained, individuals are exposed to five “layers of environment” which are important in shaping “development of the human being from childhood to adulthood” (Egological theory, n.d.). Thus, a person first learns things through their direct microsystem, or “family, school, church, friends, neighborhood,” and also through macrosystems, or “nation, ethnicity, religious group, economic or social class” (Egological theory, n.d.). One would expect that attitudes toward tattoos are first learned through contact with one’s family members, friends, and neighborhood culture and also through influence of one’s nationality and socio-economic status. Yet, as Bronfenbrenner’s chronosystem tells us, accumulated experiences over time often change individuals’ attitudes (Egological theory, n.d.). Where does our progressive state fall on the continuum of social acceptance for tattoos? First, Burlington has seven tattoo studios for a population of 42,645. That makes one shop for every 6,092 Burlingtonians (“State & county quickfacts,” 2013). IBM allows employees to have visible tattoos at work, as long as they are not offensive in nature (W. Taylor, personal communication, April, 22, 2013). Fletcher Allen Health Care’s official policy says, “Tattoos must be covered when possible” (M. Johnson, personal communication, April, 22, 2013). The woman I spoke with at Human Resources said that “the preference is that tattoos are covered up with clothing or make-up for those employees who have patient access” (M. Johnson, personal communication, April, 22, 2013). In a web article, Steve Dodge, the General Manager at Pinnacle Sales Accelerators in Shelburne said, “I was raised under the old adage: you can’t judge a book by its cover” (Hansen, 2010). The article further stated, “Born and raised in Vermont, Dodge feels that his home state’s business culture is far more accepting of differences than most of the other places that he’s worked. ‘It’s more about viewing the individual…’ says Dodge. ‘Is an employee or applicant less qualified or not as competent as someone who’s not tattooed or pierced up? No way’” (Hansen, 2010). The researchers tabulated the responses of 150 patients to a survey in which respondents looked at color computer images of male and female health care providers dressed in uniforms (scrubs). The respondents were given a number of terms with which to describe the practitioners: …reliable, attentive, cooperative, professional, efficient, and approachable. Findings showed that men with tattoos were rarely perceived more positively in relation to these terms, and women with tattoos were almost never perceived more positively, than were men and women without tattoos” (p. 15). Demonstrating that judgment of tattoos extends beyond the workplace, the video below describes how a man was denied a US Visa because authorities presumed his tattoos were gang related (CNN, Tattoos cost). -90% of respondents had at least one tattoo, 30% described themselves as “heavily” tattooed. -100% of the tattooed respondents said they’d received positive reactions to their tattoos, including compliments from strangers, friends and family members. One respondent stated, “With every couple of negative reactions, I receive many positive reactions as well. People saying…that I am beautiful and my tattoos are really interesting to see on someone who is otherwise quite ‘normal’” (J.Stone, written communication, April, 22, 2013). -20% of the respondents with visible tattoos had to cover their tattoos at work. There is little doubt that tattoos are growing in popularity and becoming a common form of self-expression. Many of my respondents felt that tattoos are becoming more and more socially accepted in the workplace, within families, and in all aspects of everyday life. I have often wondered if we are witnessing the powerful resurrection of an art form nearly as old as human culture itself. 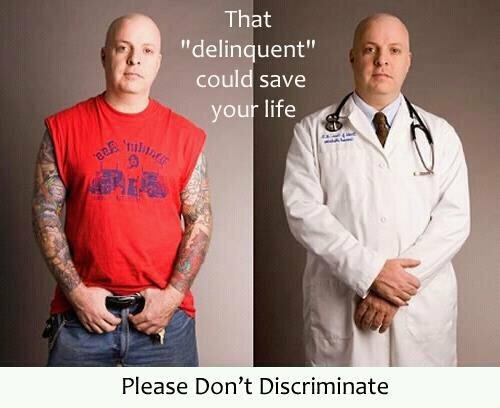 I hope the day will come when tattoos are looked upon much as jewelry and clothing choices are — with respect for a person’s right to a uniquely individual appearance. Wise Sylvia Plath once wrote, “[W]ear your heart on your skin in this life” (Plath, 2013). Victoria Fitzgerald: Mother, Student, Wanderer, Pork Afficionado, and lover of all things Science Fiction, currently lives in Louisville, Colorado.